There have been many books written by psychics but this has got to be one of the more credible. 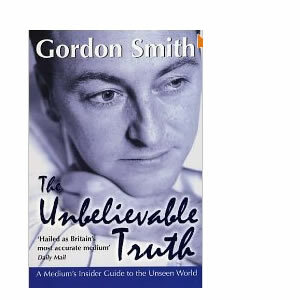 Gordon Smith has been hailed as Britain’s most accurate medium. I saw him the other day at a theatre in Birmingham and clearly the audience were astonished at the detailed factual information he gave that was confirmed by the individuals he was talking to. Of course our western culture tends to be sceptical about anything that is not rationally understood and claims by a medium such as Smith are highly contentious within the world of science. Having said that many people nevertheless embrace paranormal beliefs. Gallup has conducted several polls and find that about three-quarters of the American population believe in the one or more paranormal processes. The medium comments on how amazing it is to watch the reaction on someone’s face when a certain piece of evidence comes through from the other side. It can put a light back on in a person’s life. One example is when he was talking with the woman in her mid-forties who had arranged a half-hour sitting with him. He heard the voice of a young man by his left ear saying ‘Mum I’m here’. Smith passed on his name, how he passed away and many features of his life. All seemed to be going well until the woman asked about a special code she had arranged with her son before he died. Her face fell when nothing came back. Smith often looks at a private sitting as the spirit person getting a chance to make a phone call through the medium. If we imagine what we would say to our family in what might be a one-off call, it would probably not be a very measured and concise conversation. For me his sitter exemplifies the sceptical attitude of many. Despite all the evidence that it was her son who was present, she still disbelieved. However, finally as she stood up to depart, he heard her son suddenly call out the word ‘clover’. This was the code that they had agreed upon. This links in with the attitude of Christians who have traditionally been wary of contacting spirits through the agency of a spiritualist medium. The book has a chapter on heaven and hell. He points out that some people fear that loved ones are held in some ‘dark Hell realm’. They are seen as having led less than perfect lives. This applied to an occasion in 1966 during a private sitting with a well dressed but sad looking woman. The medium heard the voice of a young man in the spirit world telling him that this was his mother. The information came through that Mike had been suffering from AIDS and knew he was going to soon die. One night he had simply decided to take some tablets from the bathroom and end it all. This rather than involve everyone around him in prolonged emotional suffering. His family had already died a social death with neighbours and so-called friends. Smith says that the real hell is a state experienced by people who are locked in personal torment. If they grow from the experience of awareness of the wrong they have done then no afterlife judgment is needed. Living with the emotional pain they feel from this is punishment enough. There is much more in this book. Not only what it is like to be a medium. Also it is about poltergeists, hauntings, altered states etc. A lot of this I find helpful and believable. It fits in well with the idea I favour that we are simultaneously part of a physical and spirit realm. Also that, as Smith says, the part of us that is the material world is the size of your thumbnail. Next Next post: Fidelio: A Critic’s Disappointment.